Incarceration of children is rising rapidly throughout of Australia, with indigenous children most at risk of imprisonment. Indigenous and non-indigenous children have been subject to detention in both welfare and justice systems in Australian states and territories since colonization. Countless governments and human rights enquiries have attempted to address the problem of the increasing criminalization of children, with little success. 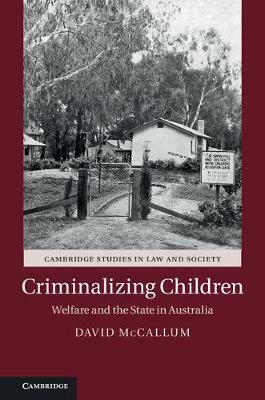 David McCallum traces the history of 'problem children' over several decades, demonstrating that the categories of neglected and offending children are both linked to similar kinds of governing. Institutions and encampments have historically played a significant role in contributing to the social problems of today. This book also takes a theoretical perspective, tracking parallel developments within the human sciences of childhood and theories of race. Applying a social theoretical analysis of these events and the changing rationalities of governing, McCallum challenges our assumptions about how law and governance of children leads to their criminalization and incarceration.